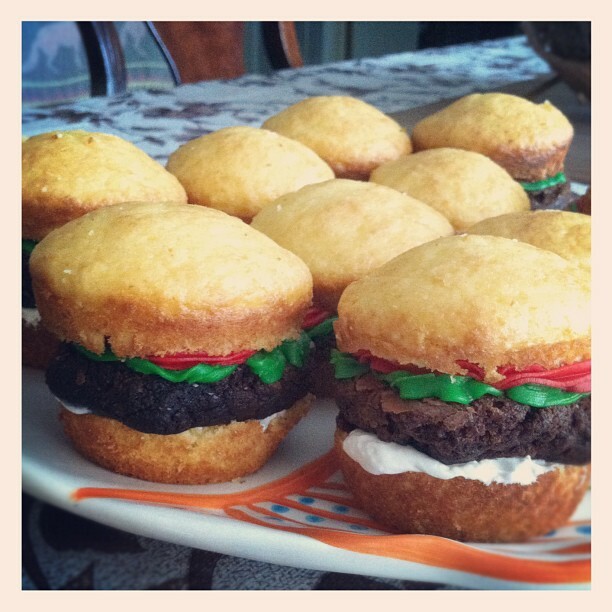 Here's a quick little "how to" on how to make your very own mini cupcake burgers, or sliders. Whatever you fancy. Preheat oven to 350 F. Spray a muffin tin lightly with cooking spray, and set aside.Whisk together the flour, cornstarch, baking powder, baking soda, and salt into a large bowl. Whisk the soy milk and vinegar in a small bowl and set aside to curdle, about 10 minutes.Beat together the soy milk mixture, oil, sugar, and vanilla extract in a large bowl. Mix in the dry mixture, and fold gently until no large lumps remain. Fill tins 2/3 full and bake at 350 for 20-22 minutes or until lightly golden. You can also use liners if you want. Preheat the oven to 350 degrees, spray a 9x13 baking pan with cooking spray and set aside. Sift together all the dry ingredients in a very large bowl. In another bowl mix in all the wet, slowly pour wet into dry and gently mix until well combinded. Pour into pan and bake for 25-30 minutes or until toothpick inserted in center comes out somewhat clean. I like my brownies to be "fudge like" and for this certain recipe, I like to cool the brownies completely and just scoop out a handful and mold into patties. If you have brownies left, eat it or... Well just eat it okay? Beat together the butter and shortening until nice and fluffy, slowly add the powdered sugar a cup at a time, until creamy. If needed add soy milk to reach desired consistency. Put into bowls and add food coloring.